Justin Chinchen is the creator and chef who developed a world class line of unique BBQ and Hot Sauces. And he is the founder of Redlaw Sauce Company. Check out our Shopping page and try our to-die-for BBQ and Hot Sauces. But besides developing and bottling his own line of sauces, Justin saw a need in the industry when he discovered that many natural food producers simply do not have the time, money, or wherewithal to scale their production to penetrate the market. So in addition to Redlaw Sauce Company, he founded Redlaw Co-Packers to address this need -- offering efficient and affordable solutions to start-up natural food producers. If you are interested and ready to take the next step with your natural food start-up, give Justin a call. You can contact him directly at the email and phone number below. With Redlaw Co-Packers by your side, we can take you from inception to shelf and anything in between. Whether you are a pre-existing food company or a start-up, we are with you every step of the way. 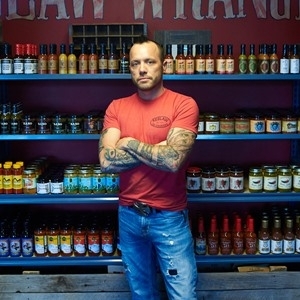 The complete story of the Redlaw Sauce inception is legendary at this "outlaw" company. Click HERE to read the full story of Justin Chinchen and his enterpreneurial adventure. 1.We fresh, and buy local when possible. 2.No additives or harmful ingredients ever added. 3.Whether it's shallots, onions, garlic, habanero, blackberries, red onion, lemongrass, ginger, green onions, kiwi, serranos, or cilantro, our standard is the same for all ingredients. . . Besides the natural ingredients, it tastes AMAZING. Friends turned us onto the Serrano Apricot Barbecue Sauce. We bought 2 bottles at the Mount Carmel church fair and we now have a new favorite BBQ sauce!! Biggest bonus --- it's made right in Golden! You can't go wrong with Redlaw, all of their sauces and their co-packing services are top notch. If you are passionate about eating or making sauce give these guys a call. Redlaw's Teriyaki has a great balance between sweet and salty. Use as a marinade to let the kiwi tenderize your meats. Made with real sugar and natural soy sauce.